Directed by Michael Mann, this crime thriller was the first to feature Robert De Niro and Al Pacino acting together in a film. De Niro is head of a professional bank robbing ring and Pacino the cop out to bust them. This film is sleek and stylish, the signature mark of director Mann, and filled with troubled characters. You want atmosphere – this is your film. And why is 1995 special? That was the year Suzanne Furness had her second daughter, although both of them were very special. Suzanne is a children’s writer and very fond of unicorns and the color purple. She has a special monthly feature about birthstones and in between is happy to feature her fellow writers. A teacher by day, writer by night, Suzanne brings a touch of grace and peace to our chaotic online world. 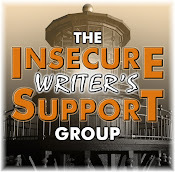 Suzanne blogs at The Word Is..,. 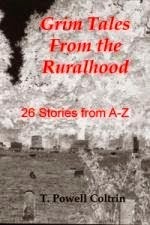 Teresa (who blogs at Journaling Woman and The Ruralhood) just released her 2012 A to Z Challenge project – Grim Tales from the Ruralhood. The stories were great! You can purchase it at Amazon and Barnes and Noble. Have you seen Heat? Following Suzanne? 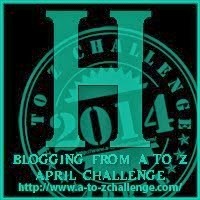 Enjoying the A to Z Challenge? Picking up Teresa’s book or remember her 2012 Challenge posts? Anyone else plagued by pollen? And what do you remember about 1995…? I assume that gas price is per gallon. Sadly we pay $1.70 a litre now. Ouch. And I hope the pollen difficulties ease off for you - I had a course of desensitising injections which made a HUGE difference. These posts are making me feel really old LOL! But I am enjoying this stroll down memory lane! Another wonderful post of past years. Love the Captain Ninja at the end. Heat and The Usual Suspects were both great movies! I'll have to head over to Suzanne's blog to say "hello" soon. I've always been interested in birthstones. usual suspects.....great movie.....and i remember gas down to 89 cents....1.09 felt expensive...ha...little did we know eh? Pollen is a major pollen this year. Even for me and I've never had a problem before. Congrats to Teresa! 1995 - THE year for movies! Heat is one of the best out there, never mind Usual Suspects & Braveheart. LOVE. Sorry 'bout the sneezing fits. Hopefully they won't last long! Loving these posts Alex! :-) Two of my faves mentioned here - the movie Heat (Pacino and DeNiro together, I was ecstatic) and Alice In Chains. Mostly I remember the winter of 1995-1996 for being dreadful. We ended up with something like 4 feet of snow or more. That is A LOT of pollen! Yes, the pollen is awful! But I think we're supposed to be getting some rain this afternoon...might wash some more away. Okay, wait a minute…my mental timeline is a total mess right now. I remember taking my son to Burger King while we lived in Germany and he was crying that he wanted a Woody. All the military folk around us bust out laughing after he didn't stoping yelling about he needed a Woody. The thing is, that was in 1993, right after my second son was born because we were back in the states a few months later. But, I just looked up Toy Story to make sure I wasn't losing my mind - it says 1995. What the heck? Did Burger King release the toys in advance? Did we get it on military installations early? I'm so confused!! I have a funny story about Heat, but this comment is long enough. Let's just say, I thought DeNiro and Pacino were the same guy for almost the whole movie….I never claimed to be the brightest one in the bunch. Elephant, per gallon was the only price I could find. Kyra, you're a young pup! Brian, we had no idea how greedy the oil companies would become! Lisa, you rock! And that's a lot of snow. Elizabeth, some washed away yesterday and then more took its place. Elsie, that's funny. And no idea. They shouldn't have gotten the toys more than a month or two early. I remember dragging friends out to see Toy Story. Loved that movie. Heat, it was joy for me, but not one of my favs. Saw Winter Soldier last night. Incredible, and like you said, it changes everything. Wonder what's going to happen to Agents of Shield now? Time does fly. It's been a while since toy story. 1995 was the year I got married, too. Do I ever remember the NC pollen. We have pictures of blue cars turned green and yards absolutely coated in the stuff. It was also impossible to stop it getting in the house. Luckily it didn't make me sneeze although something here does. I sympathise with you Alex. Toy Story, Apollo 13 and Braveheart. Apollo 13 comes up on TV ad I watch it every time and I am still sitting on the edge of my seat although I remember when it happened and I don't know how many times I've seen the movie. I also remember when they lifted the speed limit. Made one heck of a difference in the time it took us to travel to NC from Ontario. I don't remember the movie Heat, will have to investigate. Allergies inflict their toll on me almost everyday of the year. You are lucky you only find discomfort in Spring. I haven't seen Heat, I don't think. But I love Apollo 13. Michael Mann has directed some incredible movies. Who would have thought in 1995 that Toy Story would still be going strong. Most of all, I'd love to have the gas prices back from then. I'm very blessed not to have allergies, particularly when I live in a place that has two very strong allergy seasons. And let's see... What I remember best about 1995 is that was the year of my 10th wedding anniversary. Sorry you're troubled with allergies. My hubby has a terrible time with them. You know, the problems we have are mostly our own fault. There are male trees and female trees. Female tree produce fruit while male trees produce pollen. People don't want to have to clean up the fruit, so must of the decorative trees are male--hence tons of pollen. Loved "Usual Suspects" and "Apollo 13." Ken, very cool. And was it no awesome? Did you see S.H.I.E.L.D. last night? Off in a new direction now. Melissa, I picked a good year then. Carolyn, they also attack when I mow the lawn. Mason, we all want those gas prices back! Donna, now I know. We need more chick trees. Yes, the allergy season. Sorry you're suffering through it! Mine actually kick up in the fall. Big ups for AIC and White Zombie! I think Jar of Flies is in my car's CD player right now actually. Usual Suspects is a classic for sure. I don't think I ever saw Heat. And down here in FLA we've already had our pollen attack. There's a layer of film on my car still. Now we're getting the rain to wash it away, thank goodness! My hubby's and son's allergies have been all jacked up. It's hard to believe it's been this long since the Usual Suspects was out. Definitely one of the best twist endings ever. I always enjoy Suzanne's birthstone posts. 95 was probably the worst, darkest, most painful year of my entire life, so far. Ah the memory of the 49ers triumphs. I want to see them win again. Suzanne's having internet problems. I'm having another blonde day and almost put the wrong instructions on the blog. I sneezed a lot recently. Blowing my nose would usually stop it, but now it carries on for minutes at a time. It could be the pollen. And yes, I am still sneezing, either by pollen or dwarf hair. Apollo 13 is another favorite movie of mine! Thanks for the shout out about Grim Tales. I'm still in mourning over the lower prices of gasoline. You know I can't remember ever seeing Heat. Must put it on my list. Allergies are really coming out now. My poor husband has them bad. Yay for Suzanne! She's a wonderful lady. Hm, 1995. I finished my Sociology degree and started on my Philosophy one. Yeah, I know, Philosophy. Dimebag Darrell was a nice addition on that Anthrax album, but still one of their weaker efforts. They didn't really rebound until Joey Belladonna returned for Worship Music. I distinctly remember paying $0.89 once per gallon in 2000. Shame we can't go back to that ... or even the $1.09 for gas. Yay for Suzanne! I enjoy her birthstone features. I remember when gas first went over a dollar. People were outraged. What has the world come to that gas is over a dollar???? Now, everyone wishes that gas were only a dollar. I'd love to have those 1995 gas prices back! I turned 10 in 1995, and I remember being very excited about that. 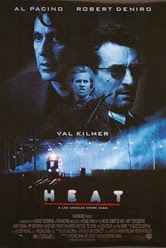 I've never seen "Heat", even though I love Michael Mann's work...especially the t.v. show "Crime Story". The "Usual Suspects" is one of my favorites and loved the twist ending. The 90s, as a whole, were a pretty fun time. My first son was born in '94 and I was still working full time. Much of '95 is a blur...though Usual Suspects is one of my favorite movies. I'm always stunned when I see gas prices from even a few years ago. Happy to report I was aware of and have even seen (!) most of the movies you mentioned, despite giving birth to Number Two Son that year. Oh, and bless you (because I'm sure more sneezes are on their way). I've been sneezing my head off lately. Yay, Spring! I'll suffer. We've had a horrible winter. Wow thanks for the mention today Alex, what a lovely surprise, really cheered me up what with all my internet issues at the moment. Still haven't got internet at home (may be a few days yet) but trying to log in and catch up whenever I can. 1995 was indeed a great year! Where did all that time go! LOL, I always love the visits from Mini-Alex!! Man, 1995 was a good year for movies! Heat, Braveheart, Apollo 13, are all classic, brilliant films. I didn't realize that they all came out the same year! I love HEAT. Such a fantastic movie—though the ending always makes me sad. And look at that price of gas. Those were the days, huh? Too bad I didn't even have a car then. "She got a GREAT A** and you got your head all the way up it!" LOL I remember furious gas was over a dollar. How times have changed. Thanks for letting me know about Charity's A-Z post! I had every CD you mentioned today! I, too, am really enjoying these posts. Love Suzanne and have been following her since last year's Challenge, I think...anyway, great choice for a feature! Poor Mini-Alex! Pollen is killing me, too. Maybe the Ninja mask helps a bit? Loved that movie. Well any movie where you get DeNiro and Pacino is worth trying. I really like Michael Mann as a director. A touch of grace and peace...perfect description of Suzanne. Love her! Heat was a good one. I thought it cast those two roles to perfection. It was down to 65 cents here there abouts, we go by liters though. Soo nice. Heat was a great movies, as was the ones listed. Apollo 13 was good, but not one I'd watch again. Ah, the good old days at the gas pump when you joy ride and still eat. I do follow Suzanne and I'm still enjoying the A to Z, but I was up at 2AM to check my H post. Thought I'd forgotten to add something. Arrrg! Suzanne is a wonderful lady! And although I thought most of my allergies were food related (except those dratted but beautiful maple trees), I have been having some sinus stuff this spring. Nooo! No more allergies! Anyway, whininess aside, I am thankful for spring! 1995 - I had arm surgery on my left arm, took 8th place in Districts for foil and saber fencing (right-handed), and started my student-teaching internship. I remember when gas prices were that low. I didn't have my own car, just my parents' to drive so it didn't really affect me. But I still look back and wish for those prices. DeNiro and Pacino - always a good combo, but didn't see that movie. Did see Toy Story and Apollo 13. Allergies, I get them. I take Reactine, and it helps. Is that the fluff that comes from Cottonwood trees in your photo or yellow pollen? We get lots of that here. Also Forsythia is blooming now, it's bad, too. Down here, pollen is the bane of so many -- including me. Hope you soon feel better! I didn't realise Toy Story came out that long ago. Awesome film. PK, in your CD player right now? That is awesome. And I hope it will end this weekend. Like to wash my car. Bob, I've not been crazy about their last few albums though. Cherie, I remember seventy-five cents! Birgit, I didn't know that. Suzanne, you are most welcome! David, you're welcome and good for you! Tina, you were a working fool. Lee, don't you hate that? Toy Story-1995? Wow. Well, I graduated from college. Feeling really old. Started my first year teaching. That was a crazy year! Where can you really go to get away from pollen?!! And don't say Alaska. I remember thinking that the bank robbery in Heat was over the top and couldn't happen. And then it did happen in downtown Los Angeles shortly after the film, guys loaded to the hilt and outgunning cops. Completely insane. I have horrible allergies to birch and oak pollen, in addition to dust, dust mites, and roaches. I turned 16 near the end of '95, though contrary to what I'd been led to believe by the media, I ended up not learning how to drive or getting a car. That didn't happen till I was 25 and almost 27, respectively. DeNiro and Pacino star together in other movies too, I think. Hardly surprising really with their awesome epicness springing into action. Despite their age I'd watch a new DeNiro and Pacino movie anyday. Love pretty much every movie that came out that year. And Alice in Chains. Good year. Definitely, I love Alice in Chains! Heat was an excellent movie. But considering the cast, that's not surprising. The pollen is a little ridiculous here in Georgia, too! Hope the mini ninja isn't having too much trouble blowing his nose with his uniform on! I have seen (and greatly enjoyed) Heat as well as all the other movies on that list- Toy Story! Gosh! Suzanne is awesome, a regular Friday Celebrator whom I enjoy a great deal. I was quite captivated by Heat. They did a nice job adding sub-plots that portrayed real, desperate human emotions. Carrie-Anne, I guess if you didn't need to drive, then why bother? Randi lee, yes they did! Wow... it's been almost 20 years since Toy Story. How did that happen? Thanks for the sign of spring. I don't suffer too much. Some sneezing and such when I'm working outside. I'll take it over the cold. Toy Story is that old? Can't believe it. 95 was the year we moved into our bigger house. Now it's too big. 1995 - I don't remember watching Heat but I do remember Toy Story! 1995 was my third year of having lived in the U.S. (after moving from the Philippines). I miss and appreciate much of the 90's. Though I'm not currently participating in the A to Z challenge, I am certainly enjoying hopping on everyone's blog! I haven't seen Heat. Hmm . . . I can't believe Toy Story came out that long ago! those movies were released in 1995? Like, just the other day, it seemed they came out to great acclaim. Plagued by pollen? My eyes are watering and now I am sneezing. Great movie. I always like Mann's Last of the Mohicans, too. I can't believe gas was ever that cheap! Anna, glad you're enjoying hopping around. Heather, that's one of my favorites! I love Suzanne. Her purple blog and unicorns always take me back to my childhood, every time I stop in. 1995 was huge for me. I remember so much, but most of it being related to my spiritual growth and development. We have those seasons, eh? I have yet to see Heat. Why haven't I seen this? I'll have to check this out. There were lots of movies I missed back then. Those were the good old days when gas was $1.09 a gallon! Well, I'm happy we can still buy gas since we were told it would run out soon! Yep. I'm pretty much constantly struggling with allergies, especially when the pollen count is high. I have not seen Heat. Hmmm ...... not sure why. One of the few movies of this sort I have not seen. Well, its about time to go on another DVD rental binge once A to Z is over. Saw it a looong time ago, and I loved it. Then, again, I love anything in the thriller category, and with these actors ... oh, so good. Apollo 13 was such a good movie. I still have it on VHS! Ah, back when DeNiro was still making good films. Been awhile. Why did they tell him he should do comedy? I remember seeing Apollo 13 in the theater with my parents when it came out. I can't believe how long ago it was. I loved Heat, such a great movie, AND The Usual Suspects, both of which should be on my own list. Susan and I have many things in common. My daughter was born in 1995, and my favorite color is purple. I better be following her! I haven't seen that movie, believe it or not. It should go into my Netflix list. 1995, I think was a bit of a blur. That's a lot of pollen. I think it would make a nonallergic person allergic. omgosh, I can remember what I was doing in 95 just by the movie releases... is that bad? lol. It's hard to believe gas was ever that low. I lived in the Bay Area when the 49ers were winning all those Super Bowls. Talk about football fever...the entire area for miles around had it going on, and it was way beyond catchy! Braveheart was and is one of my fave movies. I'm so glad I don't have to deal with the allergy headache. I hope it doesn't hit you too hard. I remember seeing Heat, and thinking it was pretty good, though by the end I just wanted it to be over, since it seemed like everything was taking forever. -_- The Usual Suspects, however, was awesome. And Warcraft II! Which is what led to me being the WoW fan I am today. Bwa ha ha. Gas at $1.09 *sad face* Oh how I wish it was still that price! It's $4.20 right now in CA. Loving the mini Alex rock star pose. I miss doing the A-Z this year, but love seeing everybody's posts. It really is a fun month for blogging!!! Congrats to Suzanne for her 2nd daughter (19 yrs ago? She can't be that old! 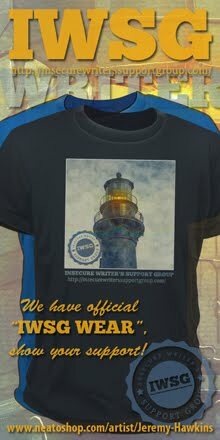 ), and to Teresa! Heard of the movie heat, but not seen it. I love Suzanne's blog. Unicorns and the colour purple are my favourites too. I still watch Apollo 13 at least once a year. I remember when it really happened. So '95 was the year my husband's all time favorite movie came out. He is a super big Braveheart fan. No, I'm not allergic. I'm sorry people are sneezing this time of year. I'm enjoying the challenge a lot! Discovering new blogs and making new friends is great fun. Heat, what a great film!!! Love the Usual Suspects as well, such a clever film. 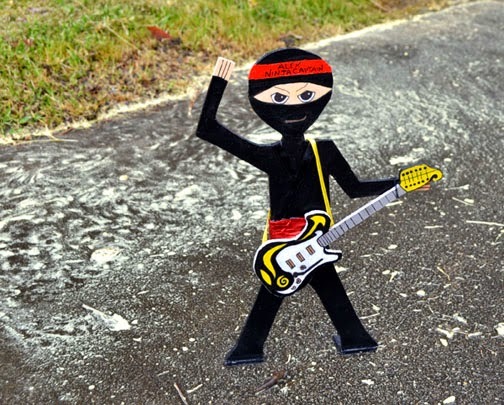 Glad to see the mini Ninja getting out, but wow, a $1.07 per gallon - don't we wish now! Fortunately I'm not bothered with any allergies. 1995 was a busy year for me with work and raising 3 daughters by myself. I barely remember that year now. Yes I'm enjoying the A to Z this year! I saw all but one of those movies that year... My daughter turned five and my son turned nine... I am visiting Teresa's blog, and yes, pollen is a PAIN!!! I'm obsessed with Usual Suspects. It has to be one of my all time favorite movies. Hi Alex - Suzanne is a great blogger and her Unicorns never fail to cheer me up. Teresa's Grim Tales .. I'll get after the A-Z .. and definitely read .. as I loved her blog last year .. while the memories she's sharing this her are just brilliant ..
$1.09 for gas? We will never see those days again. Ugh on the pollen. I have been taking my allergy med since February. Right now I think everything is trying to bloom at the same time- eyes watering, sneezing like crazy. Usual Suspects, that was a good one! I liked Braveheart too. In 1995 my husband and I, newly married, moved to California. Sorry you have a problem with pollen. I'd like to see gas prices that low, again. That would be great.